How do you feel when you heard about ‘exercise’? Exercise and excuse may go hand in hand. You will have so many excuses when you skip an exercise. But for a healthy life, you cannot keep workout plans away from you. 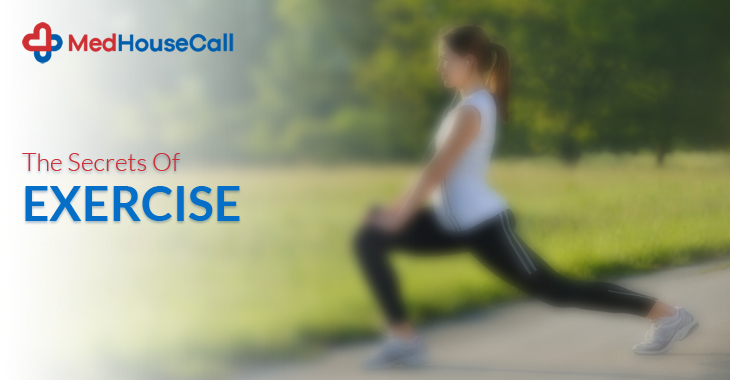 MedHouseCall brings out the secrets of exercise and it also discusses the main reasons why you need to maintain a workout routine every day. The organization is offering in-home health care services to patients with an aim to make medical help accessible to all. Experienced doctors visit patient’s place for treatment. This is an innovative idea that advances the medical assistance and people show their interest in it. When it comes to our health, how could we forget the importance of exercise? We present real facts in a simple way. People have so many confusions with their workout plans. They are always finding the best exercise for their health. Since we tend to sit for a prolonged time due to our work, we need to find out how to burn calories. We also do not have enough time for morning or evening walk. So, plan strategies that help you burn 700 to 1000 calories a day. Aerobic exercises are easy and effective for people of every age. This is also the safest option to keep you strong and active. Examples of aerobic exercise are cycling, jogging, and swimming. We all know that with age, our bones start losing its strength due to the lack of calcium. You can go for the strength training that protects your bone from aging. You must do exercises like elastic band workout, weight machines, and more. Strength training improves your flexibility and keeps you active. If you feel tired when climbing the stairs, you can experience the difference within a few weeks. Back pain has become a common health issue. Since we sit for a long time, we are suffering from this problem. If you are having this health issue, you can do flexibility workout. Go for the stretching and flexibility training. Deadlifting is another option that proves very beneficial for this. Make sure that you know the proper way for the deadlift. So, these are some of the ideas for your exercise that does not take your so much time. Understand what you need and go for it. For any healthcare issue, contact MedHouseCall. The health organization offers on-demand doctor house call service to patients. If you are too sick to step up from your home, call doctors to pay you a visit.